North Country Canoe Outfitters operates under a contractual cooperator agreement with the United States Forest Service. This agreement insures full compliance with all regulations, as well as insurance coverage. The U.S. Forest Service has announced the fully developed version of their Wilderness User Fee Program. Stemming from deep cuts in Department of Agriculture budgets, the fee was approved by congress as a way to fund BWCA Programs. Various Projects that will benefit from the increase in funding will be User Education, Portage & Campsite Maintenance, and Law Enforcement. The basic fee was set at $16.00 per person, per trip. As a concession insisted upon by outfitters who lent their conditional support to the basic concept, youth (17 and under) will be charged half rate: $8.00. In compliance with Federal directives, holders of US Golden Age Passport cards, and holders of US Golden Access cards, will also be charged the half price rate. Permits are available on a “first come” basis beginning on the last Wednesday in January. North Country will take care of the initial Federal paperwork involved as part of our reservation services. Your trip charges are exactly the same whether we reserve your permit, or you reserve it on your own. At the time an entry permit is reserved, a reservation fee ($6), and two adult camping fees are due ($32). This results in a governmental charge of $38 per group permit. Upon arrival, the actual fee is calculated for the actual number and ages of the participants. Any amount change, due or refund, is settled at that time you start your trip, and netted on your invoice. Each individual travel party (1-9 people) must complete a permit application to notify us of their park choice. If you are reserving for more than one travel party, an application must be completed for each group in your reservation. Permits are reserved in the name of the travel party leader(s) who will be on the trip, so it is important that you provide very accurate information at the time of application. • Which Park (BWCAW or Quetico) you plan to travel in. FEE PAYMENTS MUST BE MADE VIA CREDIT CARD NUMBER ONLY at the time of permit reservation. Unlike the non-refundable Reservation Fee of $6, the User Fees portion ($32) is fully refundable if the trip is cancelled 72 hours or more in advance of the entry date. Following the rules and regulations of the Boundary Waters helps insure a wilderness experience, keeps campsites available, and reduces the impact man has on the wilderness. Regardless of time of year, day-use or overnight permits are required within the Boundary Waters. You must also comply with your permit and only enter the BWCA at the entry point and on the entry date shown on your permit. The maximum group size in the BWCA is nine people and four watercraft. 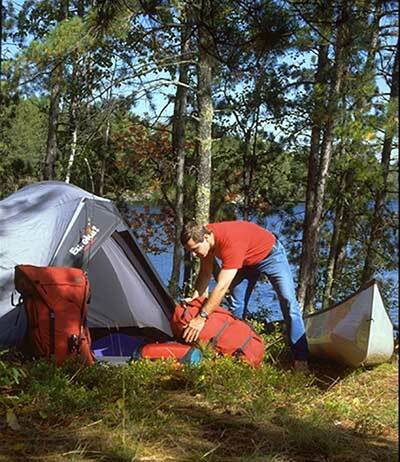 You may not exceed either limit at any time or at any place in the BWCA, including portages, campsites, or waterways. Do not throw fish remains or other litter and garbage in the lakes. Dispose of fish remains 100 yards or more from waters edge and campsite. Litter should be taken back home with you and disposed of properly. Use latrines at designated campsites. Latrines are not garbage cans and should be used for the intended purpose only. Personal waste items such as cigarettes, cotton swabs, or plastic feminine products should always be packed out and should never go into the latrines. If you’re not near a latrine, dig a small hole 6 to 8 inches deep at least 150 feet or more back from the water’s edge. When finished, fill hole and cover with needles and leaves. Cans and glass bottles are not allowed. Containers of fuel, insect repellent, medicines, personal toilet articles, and other items that are not foods or beverages are the only cans and bottles you may keep in their original containers. Food may be packaged in plastic containers that must be packed out with you. Due to potential fire danger, fire restrictions may sometimes be in effect. Always check current conditions before your trip. Restrictions may ban campfires and may add further restrictions. Camp stoves are recommend over campfires as they do not require fire wood, heat food faster, work better in wet weather, and are generally safer. Fires are only allowed within the steel fire grates at designated campsites or as specifically approved on your visitor’s permit. If you build a campfire, use only dead wood found lying on the ground. Do not cut or break branches, or peel bark off standing trees. Paddle further down the lake from your campsite to gather dead and down wood. It is recommended to bring a small folding saw to cut wood from fallen trees. Always keep water near your campfire and drown the fire if you are going to leave it. Do not leave it burning when you go to bed. Ashes should be cold to the touch with a bare hand before leaving unattended. Leave archaeological, historical, and rock painting sites undisturbed. Camp only at Forest Service designated campsites that have steel fire grates and wilderness latrines. You may camp up to 14 consecutive days at one site. Be sure to make camp early enough in the day to be able to find an available campsite. Keep the campsite clean and free from litter. Do not build structures, cut live wood, carve names in trees, or write on the rocks.